Note: this is a completely unsolicited review - I saw the product and fell in love. While waiting for the Garth Brooks concert to start a couple of weeks ago, I was flipping through Facebook and saw the coolest thing ever. 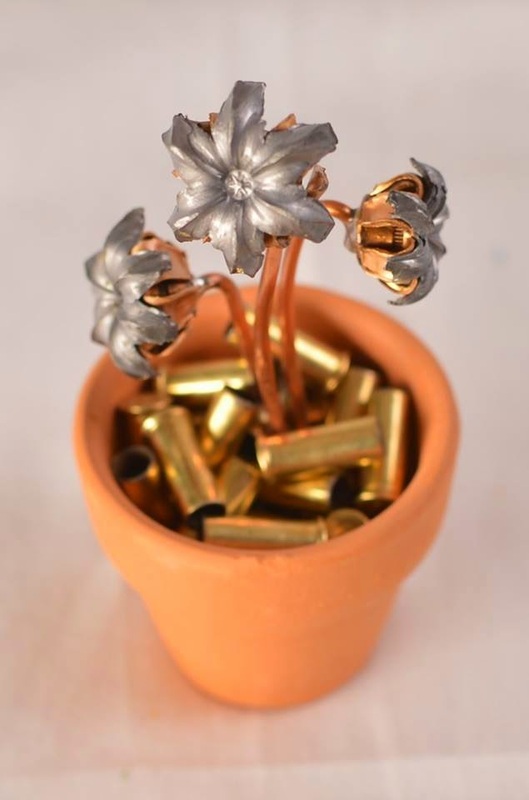 A flower pot with beautiful flowers that would never wilt or die, made by Bullet Bouquets. I had to have one of these bouquets, so I told Jay that's what he needed to get me for our anniversary next month. But I just couldn't let it go - I mean, look at how cute that is! The .22 brass "soil" and perfectly "bloomed" copper jacketed hollow points. It's perfect. Because I couldn't let it go, I placed an order to give to a friend. You know, to just see if I liked it in person as much as in the picture before I told Jay that he really, really needed to get me some of these flowers that will never wilt. I literally placed the order on my way home from the Garth Brooks concert. I couldn't even wait until the next morning to place the order, I was that impatient. I placed the order early, early on Wednesday morning and had it by Monday. I probably got lucky in the quick shipping because they are a Colorado company, so the distance was pretty short. Even though I bought it as a gift I had to open it. You know, just to make sure it wasn't damaged in shipping. They had it packaged carefully in bubble-wrap, with the "dirt" in its own little bag to add after the flowerpot was unpacked. I shouldn't have worried about the packing, because these bouquets are actually very sturdy. I assembled it by pouring the "dirt" into the pot and let it sit on my desk for a couple of days. When I started to think that maybe the present I'd gotten for someone else looked really good on my work desk, I packed it back up so as not to give into the temptation of keeping it. I gave it to Tara to keep on her desk as she's writing and she was every bit as delighted with it as I was. The quality was great, it wasn't flimsy at all, and I got it in a timely manner. I definitely recommend this company to anyone who wants to give a great gift to the shooter in their lives.